This post is by Jess Adamson. Do you know what great worth is hidden within you? Do you know that you are not just valuable, but indeed you are PRICELESS in the eyes of God? Do you know that that worth, shines through your eyes, and almost everyone can see it? Regardless of your race, your religion, your orientation, or your past, know this: God spent time to create YOU. He knows YOUR story. He hears YOUR language. He loves YOU. I am a mother of three beautiful little boys. They make my world a crazy, messy, exhausting, and wonderful place. So often, I go to my friends houses, and wonder why it is, that they are so capable living what I call a "pintrest life." You know what I mean. They do crafts with their kids, their houses are spotless and decorated. It is so easy to get caught up in everything I'm not doing. Its so easy to say "I am not enough, look at everything my kids don't have" and then I realize, it is in those moments of self doubt and insecurity that I am giving Satan exactly what he wants. I am letting myself believe that my worth is NOT great, in the sight of God. When, in fact, it is. I may not get my dishes done everyday, My children probably watch more tv than they should, but you know what? Its okay. Its okay because I know, that they know, that they are loved far beyond what their hearts can comprehend. Its okay, because I know, that I am allowed to make mistakes. I am allowed, to not be perfect. I am allowed to always strive to become a better version of myself. Why? Why am I allowed those things? Because of the Savior. Because his atonement, was for SO MUCH MORE than sin. His atonement was also for the days that I feel less than. For the days that I forget what a valuable piece I am in His eternal puzzle. His atonement, was for every moment of self doubt, every fight with depression, or anxiety, for EVERY time you start to forget just how important you are.....know, that Jesus Christ has felt that. Know that he KNOWS YOUR HEART. If you ever find yourself in a situation when you are racked with feelings of inadequacy, fear, or worthlessness... please remind yourself of one thing. You are a child of God. He loves you. 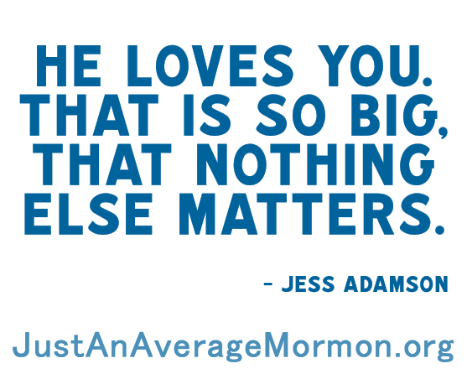 And that is so big, that NOTHING ELSE MATTERS. Happy Monday! Thanks for reading. Absolute LOVE! I love this girl. I love her heart. I love these words. I love her soul. Just perfect LOVE! Thanks for sharing this. Perfect reminder! My three little blessings keep me a little topsy turvy, too :) Thank you for sharing your heart with us today! THANK YOU SO MUCH! Reading your words describing your life in the day of motherhood was like reading a chapter out of my own life. There are days when I get absolutely nothing done and I feel angry, anxious, and overwhelmed at the fact that we don't live an ideal "pinterest life." Thank heavens for the atonement, for Jesus Christ's unconditional love for all of us, and for women like you who share your experiences and insight so that women like me can be reminded of truths and also not feel so alone in this motherhood business. :) Thanks again and God bless!